It seems like every time I go to the grocery store lately for the last few weeks there is chicken on sale and I come home with a lot of it. We have been making a lot of chicken lately and cutting back on red meat where we can to try to be a little healthier and let’s face it – no matter where I seem to shop lately beef is very expensive so we may as well have some poultry. I have a lot of chicken recipes to use, so there is always plenty for me to try, so we’ll be doing chicken recipes all week this week. First up was a simple dish that I saw from Bon Appetit that they actually use for their wings but I simply adapted it to use with chicken thighs and drumsticks instead. It is for bourbon glazed chicken and the glaze tastes delicious. Melt the butter in a large heavy saucepan over medium-high heat. Add the chopped onion and garlic and saute until golden brown, about 5 to 6 minutes. Add 3/4 of a cup of the bourbon and boil the mixture until most of the liquid is absorbed, about 6 to 8 minutes. Whisk in the remaining 1/4 cup of the bourbon, the ketchup, hot sauce, tomato paste, and the brown sugar until it is well blended. Reduce the heat and simmer until the sauce thickens slightly, stirring occasionally, about 10 minutes. Season the marinade with salt and pepper to taste. Remove the marinade from the heat and allow it to cool to room temperature. Place the chicken parts in a large glass baking dish or roasting pan. Pour the marinade over the chicken parts and turn the chicken to well coat it. Cover the chicken and refrigerate it overnight. Preheat the oven to 375 degrees. Line a baking sheet with foil or with parchment paper. Place a cooling rack on top of the prepared baking sheet. Arrange the chicken pieces on the cooling rack, spacing each piece slightly apart. 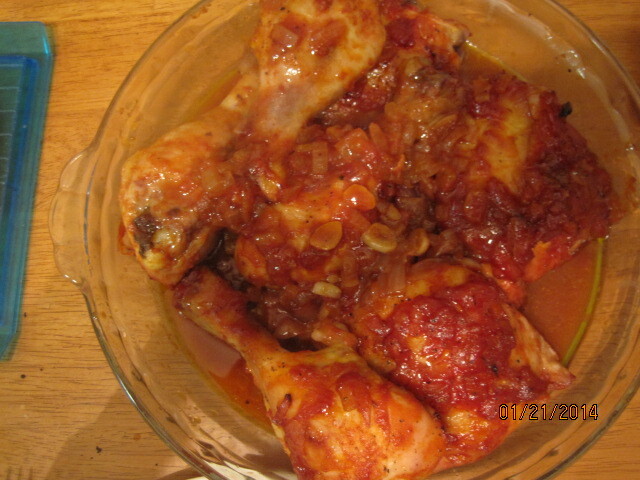 Spread any of the remaining marinade from the dish over the chicken parts. Sprinkle the chicken with salt and pepper. Bake the chicken on the cooling rack in the baking sheet until the parts are cooked through and an instant read thermometer inserted into the thickest part of a thigh registers 165 degrees and the skin is browned, about 45 to 50 minutes. Transfer the chicken to a serving platter and serve. I can see that this recipe would work really well with chicken wings and I think it tasted great with the chicken parts. The bourbon gave a nice sweetness and with the brown sugar, the ketchup and the hot sauce it was like a nice barbecue sauce with a little heat and sweetness. I would certainly use this recipe again for any chicken parts. It might even be better if you can use it on the grill. Marinading it really makes a big difference with this one as it really enhances the flavor, so let it sit overnight if you can. 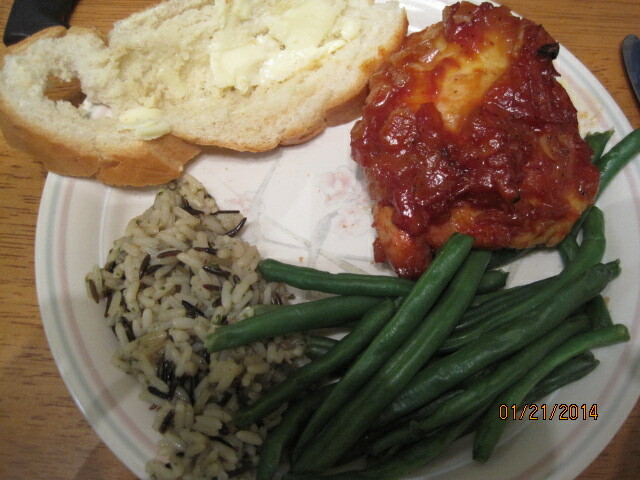 I served the chicken with some wild rice and fresh green beans. That’s all I have for today. Check back next time to see the next chicken recipe. until then, enjoy the rest of your day and enjoy your meal! Thank you for using actual bourbon! So many “bourbon” chicken recipes don’t. Looks delicious!!! Nancy – I agree! I have seen lots of recipes that don’t use the bourbon at all. I like the flavor it imparts and have used it in other recipes even though I am not a bourbon drinker. It was very good and I can see using this one again since it was so easy to do. Thanks for the comment! Thanks! Even though it sounds like a lot, much of it cooks off initially and you get a nice flavor in the glaze from it. I thought it sounded like a lot too, but for the amount of chicken used, it seems to work out pretty well. You can always play with the amount and see what’s best for you. Thanks for the comment!